May 2nd my round belly was one of the amazements as it represented the little one that was soon to make his way into the world. May 3rd, well my belly was not so amazing anymore for it was mushy and weak! All I wanted to do was restore my abdominal function and regain some tone in my abdominals. Luckily, my career focuses on post-partum and women’s health, and felt confident with how to regain back my core in an efficient and effective manner. Since I had an umbilical hernia and diastasis, this is where your abdominals split in the midline; I immediately wore an abdominal binder and got to work on strengthening and restoring my core strength and function. The binder was there to help my lengthened abdominals return back to their position. This coupled with core strengthening would help me re-establish my belly. With the restoration, I promised myself to honor the changes pregnancy placed on my body, the length of time my body underwent those changes, and the enormous amount of work my body was doing post-partum to regain a new hormonal balance, as well as, heal a very large wound in my uterus. If I did not honor these changes, then I was setting myself up for injury, illness, and/or failure. Thus, the first part of this blog will discuss just 3 lifestyle habits, and the second part will expand on the movement concept with core strengthening and 2 quick 10 minute workouts to help you regain your belly back. This is not a time to start a low calorie diet, but it can be a time to establish good eating habits. It is so easy to eat on the run or super-fast, skip meals, or eat whatever is available when you are a mom of a little one. Taking time to prep healthy snacks and meals can be key to eating well and losing weight safely. Establish a prep day for veggies and meals or delegate help from a friend/sitter or the supermarket. Recognize what time of days seems most optimal to prepare meals. Mornings seem to be a time that I could cook the meal or meals, since we had one heck of a witching hour in the evenings. When eating, do your best to slow down and chew. Sounds simple enough, but I cannot tell you how many times I have rushed through my meal to take the baby and not even sure I have chewed my food. BUT, I have gotten a lot better. I try and take smaller bits, and even do more smoothies on days where sitting to eating a meal seems unattainable. Remember studies show those who eat slowly and mindfully will tend to do better on diets and not overeat. You want your body back, and you know part of that requires exercise. In the early part of your post-partum phase, the key is to move and re-establish your core with everyday movement. Often times I hear moms sabotage themselves with thinking that the only way to lose the baby weight is to hit that baby boot camp class. And when you have been up all night with a cranky little one, the 6am snooze is way easier to hit than gym. Then since the bootcamp class is missed, the poor choices in food start and less movement overall begin. Start small in your movement expectations. Focus on just keeping moving. Walking is a great way to start to exercise. 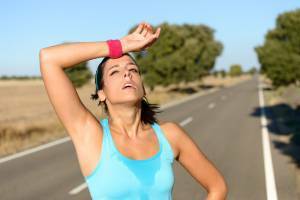 Running and cardio can be implemented if you feel that you have enough in your reservoir to recover. That means your diet, sleep, milk production and bleeding appear to be regulated. Remember you are still healing internally, so implement slowly and monitor your response. Think of all movement as a possibility for exercise. As moms we are carrying, lifting and moving all day. The more you stop and think about how you are moving and work toward moving with better posture and core activation, the flatter your stomach will start to appear. Think of a person holding a baby. You often see the mom push her hips forward and rest the baby on her stomach. Now imagine a mom who is standing tall, with the core engaged. I bet you see a slimmer mom. The key with lifestyle changes is that it takes time… up to 21 days to create a habit. And if you catch yourself looking at others and judging yourself…stop. You have no idea how much help that person has and what her situation is. She might have a chef, a night nurse, family who takes the little one, etc. Beauty really does start from within, so start your morning and end your day thanking your body for getting your through the day!